Readymade Job Portal Script is power packed for internal recruitment purpose by filtering candidates and segregates resume shortlisted and intimating candidate for the interview. Php scripts mall is one of the innovative job builder platforms where you will get an exclusive business solution for start-up or large scale industries. The script comes with well SEO optimized which enables fetching and crawling websites by search engines. Employment Listing Script has a clear dashboard namely user panel, employee view, admin dashboard respectively. 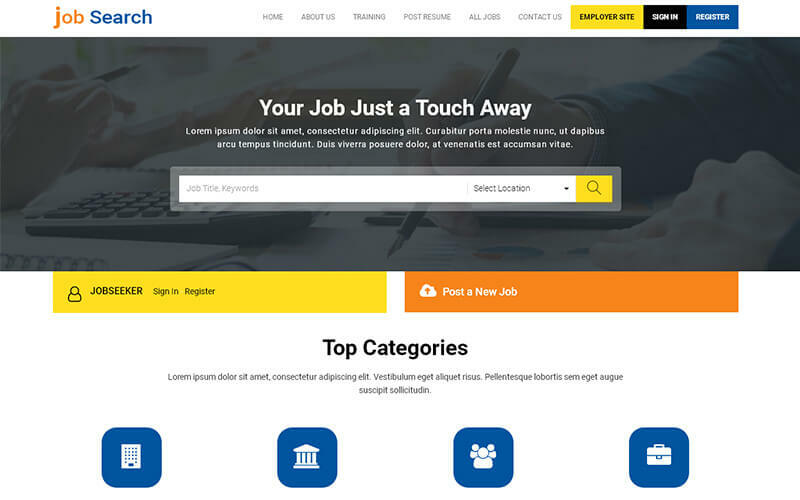 Our Job Portal Website Script enables job seekers to find the desired job easily through user-friendly navigation. Registered user can view job listing details with company logo, through the advanced search panel filter preferred job with a job type, matching experience, salary expected or by categories with the user location. The user is allowed to upload their resume to the portal to shortlist by the employers, wherein the case with premium resume package can be obtained from the admin to get a featured profile. An easy way to send money through PayPal payment gateway. An employee can register their company with valid credentials and post available jobs with company details. In the home screen employee can have job search option, view recent jobs with details, job status statistics. Employers need to get a package from admin for a Job posting to the visitors. In the blog, section employees can view various blogs with the image, post a comment in the blog. Through newsletter, subscription employees get up to date information through email. A powerful admin dashboard leverage maintaining a Job Portal Script PHP without any coding knowledge. The admin salient features are job listing management, resume, company registration control, and job package subscription, resume subscription management, testimonials, etc. General settings like site title, site address, e-mail address, time zone, date and time format, site language, payment gateway management etc. We do not encourage spammers, our real-time blocking features block entire malicious networks and some threats like aggressive crawlers, scrapers and bots doing security scans for vulnerabilities in site. Upon purchasing our employment script, we grant our clients one year of technical support and source code updates for 6 months. Once payment is done, we will make the website live with 24hours on your server. If you more queries kindly give us an email, our business associates get back to you right away. Default Payment Gateway Paypal available. if You need Additional Payment Gateways you have to contact for our Technical team info@phpscriptsmall.com Cost will be Additional. What can I say about this script? Is it smooth? Yes! Is it responsive? Yes! Is it easy to modify? Yes! Is it SEO friendly? Yes! Do you get great support? Yes! I like it. It’s a perfect script for job sites, it have all the necessary functions finally I bought it. First I thank to customer service and technical support team. They are provided exactly what I want and which functions I needed in my website. It was a great experience to work with you. You were well helpful and knowledgeable, which certainly made my job easier. I look forward to ultimately developing and implementing my business with your guidance and expertise. I have already recommended your company to some of my clients.